I have this theory about Indian restaurants. It may be a Yorkshire thing, or maybe even just a Bradford or Leeds thing, or perhaps its just me, but I reckon you can judge the quality of an Indian restaurant through a combination of how good their breads are and whether or not you get a fork. The best have astonishing breads, and might reluctantly give you a spoon to serve your curry with, if you ask nicely, but they expect you to eat it with your hands, scooping mouthfuls of curry up with a torn piece of naan or chapatti. There might be cutlery on the table in the posher places, defined really as anywhere that uses tablecloths upwards, but it normally goes unused by the well initiated, and is often viewed with a combination of scorn and pity. I’ll be blunt here – knives and forks don’t really go with Asian food … it’s too tactile, too earthy, too steeped in a different culinary culture to make them worth using much at all. Cutlery and curry just doesn’t feel right. Flatbreads like a naan or chapatti make better eating utensils, anyway, and they add to the dish, taking the edge off some of the heat of a curry and adding bulk and substance to a meal, and it’s often the bread I enjoy most about an Indian meal. Most breads are simple and unleavened, but other types have a little yeast or are partly fermented using yoghurt. There’s nothing like a naan, soft with parts stretched thin and charred, covered in ghee and garlic, but sometimes some of the other, less usual breads make a good change. This fermented flatbread – a bathura – is great. It’s got a peppery bite and a slightly sour, yoghurt undertone, and it’s surprisingly hard to stop eating once you’ve started. It goes perfectly with any type of Indian meal, but it goes particularly well with vegetarian dishes, like the chole I made last week. There’s no real magic to turning these breads out, just a little technique and some patience. Start by making a rough dough from 380g of plain flour, 20g of melted ghee, 50g of plain live set yoghurt, a teaspoon each of salt and ground pepper, and 200ml of soda water. Mix everything together and knead for a couple of minutes until the dough is smooth and soft. Set the dough aside for an hour, in a bowl tightly covered with clingfilm, to let the yoghurt work and start to ferment the dough. It will rise a little, soften, mellow out a bit. 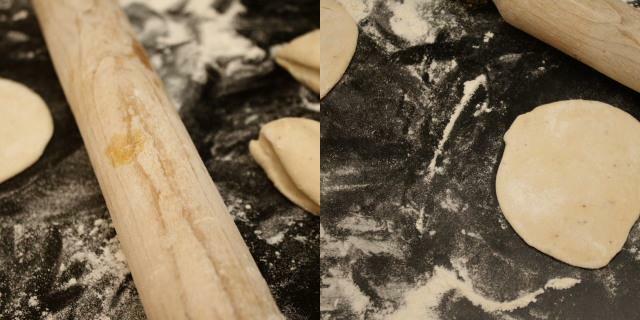 When the dough has rested and risen, cut it into sixteen equal pieces and roll each out to about 12cm in diameter, and place the, on lightly floured baking trays. Don’t let the bathuras overlap, and definitely don’t try to stack them up … they’ll stick together, and will need rolling out again. I found this out so you don’t have to. Heat enough oil to deep fry to a hottish temperature of about 180c. It’s best to use a proper thermostatically controlled deep fat fryer – they’re just much more stable and safer. Drop a few bathuras at a time into the oil and let them cook for about thirty seconds before carefully flipping them over and finishing them off for another fifteen seconds or so, until they start to brown slightly. Each bathura will puff up majestically as it cooks in the oil. Drain the breads on a plate lined with kitchen paper and serve warm. Bathuras are one of my favourite breads, and they are such a classic combination with chole. Am always wary of deep frying at home (more due to the faff of getting rid of the oil than the danger), but these look so good, I may just have to give them a go. I’ve tried making naan breads at home before, but bathuras are new to me. They look like a delicious new challenge!